This isn’t exactly a new or groundbreaking recipe, but it’s one I looooove. (And to think, I used to say I hated all nuts but peanuts.) In a few easy steps you have the smell of warm cinnamon and toasted pecans wafting through your kitchen. And then…. then you get to eat them. I’m a sucker for salty sweet snacks. Once I start eating them I can’t stop and these cinnamon sugar pecans are definitely a salty sweet snack. When I’m not just eating them by the handful, I like to chop them up and toss them on top of a salad, a bowl of warm oatmeal or some creamy Greek yogurt. I’m sure you’ll find all sorts of delicious uses for them too! In a large bowl, whisk together egg white, vanilla and water until frothy. Add pecans and toss to coat. Place sugar, cinnamon, and salt in a re-sealable plastic bag and shake to combine. Using a slotted spoon, transfer pecans from bowl to plastic bag, seal the top, and shake to coat. Spread the coated nuts out evenly on a Silpat lined baking sheet. Bake at 300°F for about 30 minutes. Cool on the baking sheet for about 10 minutes, or until cool enough to handle. Break up any nuts that are stuck together. Store in an air tight container at room temperature. You had me at cinnamon sugar.I love nuts that attain a sandy texture with sugar. I’m going to try this soon. 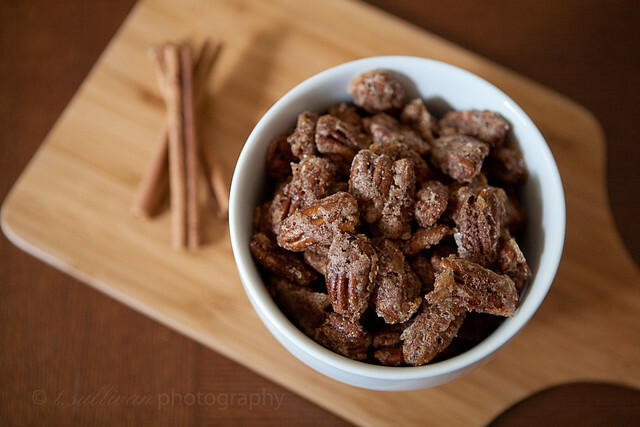 Cinnamon sugar Pecans totally make me think of the holidays. So good! First time to your lovely blog. Love your food photography and styling. There are so many uses for these sugared pecans…love ’em in salads, nibbles and adding to certain dishes. Like the addition of cinnamon. Definitely making these w/the cinnamon.